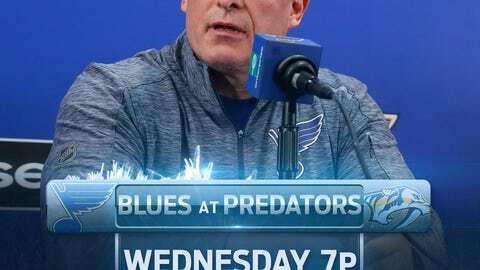 Berube doesn’t exactly get to ease into the new gig, taking St. Louis to Nashville on Wednesday night for the first of a home-and-home series with the NHL’s top team. The division rivals square off again Friday night in St. Louis. The first job for Berube is to find a way to get a puck into the net. Monday night’s defeat was the third time in four games the Blues had been blanked. This time, it was by Cal Peterson, he of three games of NHL experience. The 45-year-old Yeo was the NHL’s third coach to lose his job this season, hours ahead of Edmonton parting ways with Todd McLellan on Tuesday in favor of former Blues coach Ken Hitchcock. Having gotten a coach fired, St. Louis figures to come out with a detailed effort Wednesday night. But it went 0-for-4 last season against the Predators (15-5-1), and with key forwards such as Pat Maroon, Alexander Steen and Jaden Schwartz injured, scoring goals against Pekka Rinne won’t be easy. The Predators might regain the services of All-Star defenseman P.K. Subban, who sat out the last three games with a lower-body injury. The Blues are expected to start Jake Allen (5-5-3, 3.33, .895), who has allowed just one goal in each of his last three outings.